Without explicitly sharing it, I have been writing and working for some time from within a particular heuristic frame. For example, in the last post, I talked of “naming” as being a feature of the Scope habitat of conversations. I realised that I have been thinking, and creating solutions for clients, in these terms for so long that the model is now woven into the way I design conversations. So I better include you into my own Scoping conversation – my own high level naming of how we coordinate in purposeful enterprise, or it will just be confusing to read my stuff. So here is a top level introduction to the framework – it’s like a circuit diagram for the communication flows necessary to accomplishing shared purpose and being a viable system. If we want to collaborate with other humans in pursuit of a purpose, we need to talk. And even if we could imagine creating a new enterprise all by ourselves, we would still need to have conversations in our heads. The sets of conversations we have to have to build and operate an enterprise are predictable. We always do them. Not always well. Not always evenly. Not always in the best way that we could without frustrating our own desires . But always. There are 3 major terrains through which we must weave our conversations: – Create – the capacity to think up and deliver new things – Perform – the capacity to use existing processes well – Monitor – the capacity to reflect and learn Two notes among the many I could make: 1. This Requisite Conversation® framework is • “heuristic” – it lets you see new patterns • “fractal” – it works at many different levels of “zoom” • deceptively simple yet functions as a complex adaptive system model. The Framework allows the building of extensive knowledge about conversational dynamics at all levels of enterprise. 2. 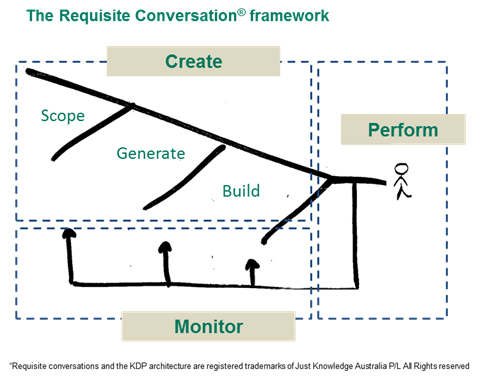 As a language convention, I refer to the larger conversational spaces (Create, Perform, Monitor) as “terrains”, and the conversational subsystems in Create (Scope, Generate, Build) as “habitats”.